How Can I Make Friends in My 12-step Program? According to the National Institute on Drug Abuse, 12-step programs “can be particularly helpful during recovery, offering an added layer of community-level social support to help people achieve and maintain abstinence and other healthy lifestyle behaviors over the course of a lifetime.” Therefore, making friends in your 12-step program is basically part of the process, but below are some tips to help you get started. Though you are, of course, never expected to speak about yourself in a group setting if you are uncomfortable doing so, you may want to prepare yourself to talk to others one-on-one about your recovery or another subject that may be relevant to meeting new people. These programs do encourage socialization and support through discussion, so many people will expect you to be ready for this if you are expecting to get to know the others in your group. 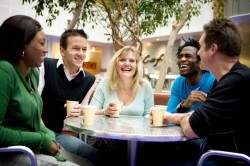 Hang out with members outside of the 12-step program so you can get to know each other better. Many times, people in a 12-step program will meet outside the group to get to know one another and to discuss their recoveries on a more intimate level. You can plan activities with one or more people that can be a fun and refreshing change of pace from your regular meetings. Remember to plan it in a place where everyone is comfortable going and to avoid bars and other establishments that place a lot of focus on alcohol or substance use. In addition, it could be helpful to plan something where people can join in whenever they feel like it, such as bowling. Generally, individuals in recovery tend to be somewhat self-absorbed, especially because it is such a difficult time in a person’s life. It is important to remember that the other individuals you are meeting in 12-step programs are going through a lot too and to listen to their problems as much as you hope they will care about yours. However, if you do start a friendship that feels very one-sided, you can always move on and meet someone else. Your friendship should be beneficial to both of you. Even saying hi to someone or asking them a question can be hard for some individuals, but if this is the case for you, these kinds of small gestures are required for making friends. It’s important to be willing to go out of your comfort zone even just a little to meet others and get to know them. Of course, you are incredibly uncomfortable with something, you shouldn’t force yourself to do it, but you should be willing to put yourself out there a bit instead of just hoping someone else will. Most people in these programs truly are looking for a friend or someone they can connect with as they move through their recovery. If you go to your meetings and try to be friendly and open, you will likely get to know people in no time who will help support you in your recovery and, perhaps, create lasting relationships with you. If you have more questions about the program or want to find a meeting near you, call 888-905-9004.